Yevgeniya Baras, untitled, 2017, oil on burlap, 28 x 25". Yevgeniya Baras’s abstract paintings embody a beauty we don’t see much of these days: scummy, grubby, and gnarled. She has a knack for using colors that are somewhere between merely unappealing and utterly revolting: mustards, moldy grays, dirty peach putty, and bilious greens. Against these she sets forms in black, white, lavender, bright blues and greens, fluorescent orange, gold, copper, and silver. The result is not exactly luminous, but she makes her hues ignite like flint against steel. Baras pulls off a similar trick with the physical construction of her works: She sometimes paints on burlap as coarse as a potato sack and awkwardly affixes it on the backside of stretcher bars, so that the burlap sinks in around the crossbars to create a topographical texture she either uses pictorially or ignores. The gritty accretion of paint on these funky structures, along with pieces of adhered wood and yarn, lends her surfaces a simultaneously excremental and archaeological quality. 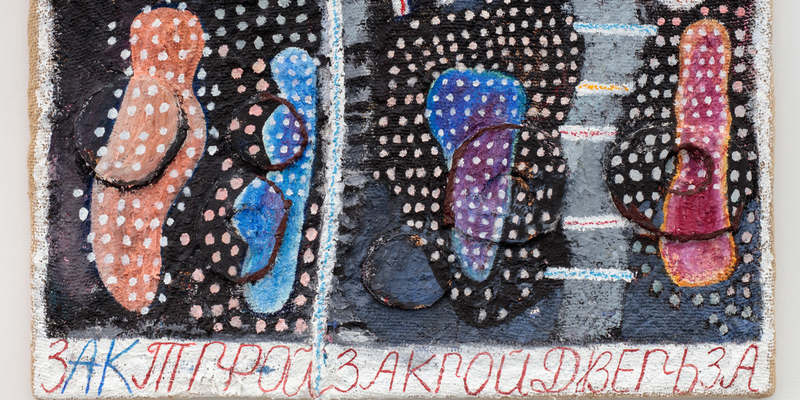 The artist’s imagery is an idiosyncratic mixture of Cyrillic text and private pictograms, sometimes legible as a uterus, landscape, or plant-like form, but often inscrutable. One picture (all works untitled, 2016 or 2017) closely resembles a tantric Shiva Linga painting, and indeed Baras spent time in Jaipur, the capital of Rajasthan in India, where the Shiva Linga painting tradition originates. Her twenty-one works on view surprise with unexpected choices and improvisations, orchestrating color, line, and shape to lock each image together in singular balance. Looking at the paintings, you might feel unable to put your finger on something, even though it is right there before your eyes.